When we wanted to get another Bichon puppy, I did a lot of research. I was very impressed with the questions asked on the Legend website, and filled out the entire questionnaire. Erayna and I exchanged many emails during the months while we waited for a puppy. It turned out to be longer than we had originally expected;18 months. I became aware of Erayna’s devotion to her Bichons, her thoughtful breeding decisions, and her loving care of the puppies and mom. Our Rigel James is everything we had hoped, and everything a Bichon should be. He is beautiful, healthy, outgoing, and energetic, as well as incredibly smart. We feel very very fortunate to have had the change to deal with such a responsible, communicative and honest breeder. Thanksgiving is fast approaching and I have been thinking of all of the things that I am grateful for in my life. 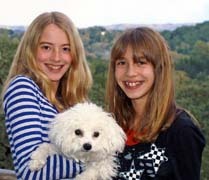 Many of the things I am grateful for have to do with you and your Bichons. 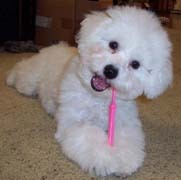 I am grateful for the great care and concern you put into breeding wonderful Bichons. I am grateful for all of your detailed responses to my many many questions. And I am truly grateful to you for our "Macy" (7 months old), who joined our family almost 4 months ago. She is such a special little dog. In fact, not a day goes by that I am not taken by just how wonderful she truly is. She is super smart, easy to train, melts in your arms, attacks her toys with everything she's got, happily sits on her beanbag chair chewing her stick, and sits and watches deer and turkeys as though she's studying them. She has fit in perfectly to our life schedule and just seems to know what to do in any given circumstance. She loves everyone she meets and makes a point of meeting everyone she sees. I have never been around a dog like "Macy" before in that she just seems more aware of the world around her, more calm in her disposition, and yet totally full of life. And besides all of this, her beautiful face will melt your heart. So, Erayna, thank you. Well, it's getting close to bedtime and Sharon's in the shower so I put him in his crate and Oh! How he's protesting! I'm sure he'll survive 10 minutes without her! Thanks again for letting us take him today...he's really such a joy! Please fill out and send Inquiry form.